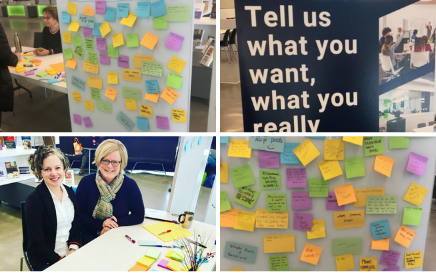 The Library set up a feedback table with whiteboards and colourful sticky notes at the West Entrance of the Riddell Library and Learning Centre on February 11. Thank you to all the students who took time to write down where they want to see change in the Library to better serve the MRU community, and also the high-fives for what you love the most about the people and services offered. Library leadership received all 173 comments recorded by students throughout the day and carefully considered each one. Students weighed in on everything from group rooms, the Maker Studio, seating, to specifics on how to best communicate with Mount Royal students throughout the semester. We’re excited to look into new ways to implement change and make improvements. Look out for updates, as we expect to share any changes made that are from student suggestions. In the meantime, refer to the infographic below for answers to a portion of questions and concerns included in the feedback.